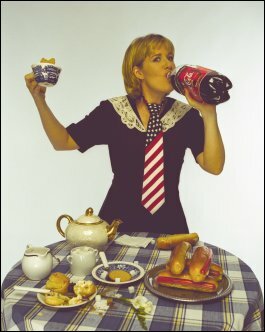 The English American is loosely based on the unique true story of adopted British comedienne Alison’s return to America to meet her birth mother. Combining stand-up comedy and theatre, this is a passionate, witty and enthralling tale which takes an honest look at the divide between them and us. The English American previewed at the Manchester Royal Exchange Theatre in England, premiered at the Edinburgh Festival’s Assembly Rooms, and headlined at the London Comedy Festival at the Soho Theatre in London, where it played to packed houses and high critical acclaim. Alison Larkin has performed her show on both sides of the Atlantic to audience of 800 or more and has raised hundreds of thousands of dollars for charitable organizations. Alison’s bestselling novel The English American, published by Simon and Schuster was a Vogue Most Powerful Book Of The Season and Redbook Magazine Pick of the month. The novel sprang from her first one woman show.